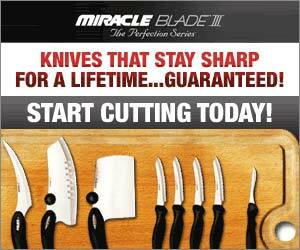 The Miracle Blade III Perfection Series knives are designed and engineered with a look, feel and cutting ability that’s revolutionary. Made to the highest standards of German stainless steel, the Miracle Blade III Perfection Series knives never dull, never need sharpening and give even the most inexperienced chef precision control over every cut. Buy 1 set today and get another set for FREE. Keep it as a backup or give it away as a gift.